Sorry, at this price our belts do not include a buckle., but see our value-priced combo sets. We stock a select few of our belts, but rather encourage you to order to your custom specifications as to color, length, width and buckle type. 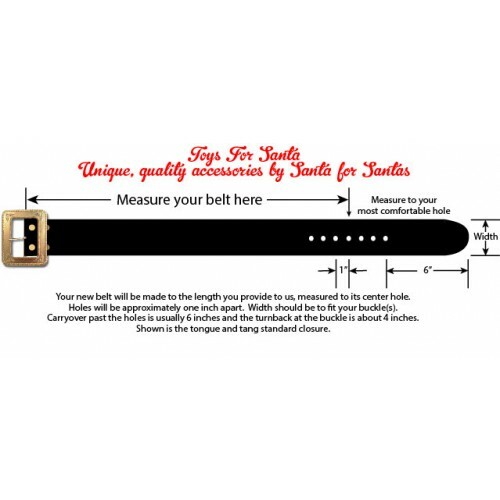 Our top-notch Pennsylvania Amish supplier routinely does either 3 3/4 to full 4-inch wide, almost 1/4-inch thick Santa belts in soft, supple, yet durable latigo leather*, with through and through color via tumble drum-dying. However, we can order widths from 3 to 4 inches wide or we suppose, even wider if you had need (contact us for pricing). We can vouch for the quality and value of these belts since we and others have been wearing them for several seasons. Prices may vary with a slight upcharge for extra lengths. As a separate belt, most of these are special ordered, although we often stock a few 4" black belts in waist size 55-56" (with holes either side for about 2 inches) and they coordinate nicely with our 4-inch holly buckles. Please allow usually two, but up to three weeks for delivery of custom lengths. *Latigo leather as is, or it can be stamped, braided or laced, but it is not ideal for tooling. Latigo is known for its soft and supple feel without sacrificing strength. Made from cowhide and borrowing its name from saddle straps, belts made with latigo leather have a beautiful natural texture. 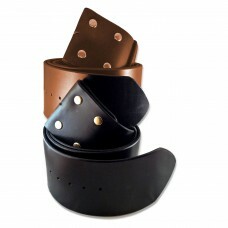 They are great if you’re looking for a belt that has a soft, smooth feel and more long-lasting than bridle leather. You should seek the stiffer, harness (vegetable dyed) leather if you wish to apply tooling or make cuts in the surface since it is much stiffer construction. We now offer two thicknesses in our belts. The regular/standard width is a supple, flexible latigo leather with a smooth-finished back side. The thinner, split leather is a bit stiffer and has a rough back side. How to measure (see image): If you have an existing belt, measure from where the belt attaches to the buckle (center support rod) to the hole that you usually use. That distance is your "Santa waist". The cookie zone is the waist circumference at the place where your belt is intended to be worn - level through the belt loops on your suit - and over your suit, and any padding you use. Normally, this is not a cinch-tight fit, but rather a bit loose, especially since it tends to get even broader (larger) when you sit down in the chair. None of these measurements have any relationship to your pant waist. Test the length in all locations and methods, but don't order one too short. You can always punch more holes to tighten it up, but you can't add any length to a belt that is too small.